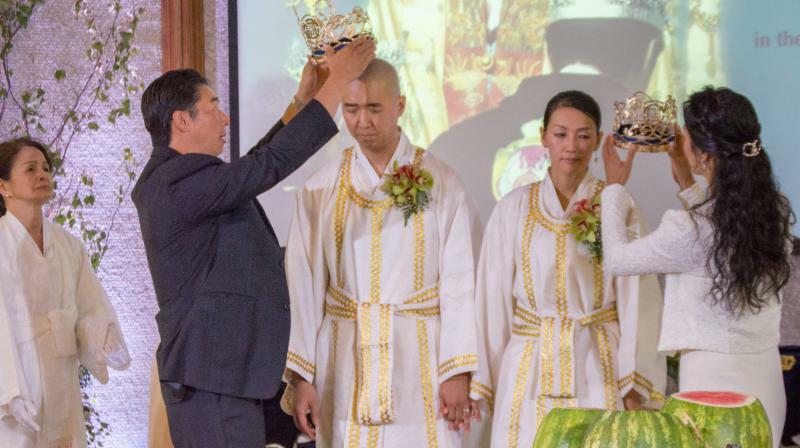 Four hundred and thirty five brothers and sisters gathered at the World Peace and Unification Sanctuary in Newfoundland, PA on Sunday to honor the third anniversary of True Father's Seonghwa and to participate in the Holy Blessing Ceremony to Restore True Father's Authority. 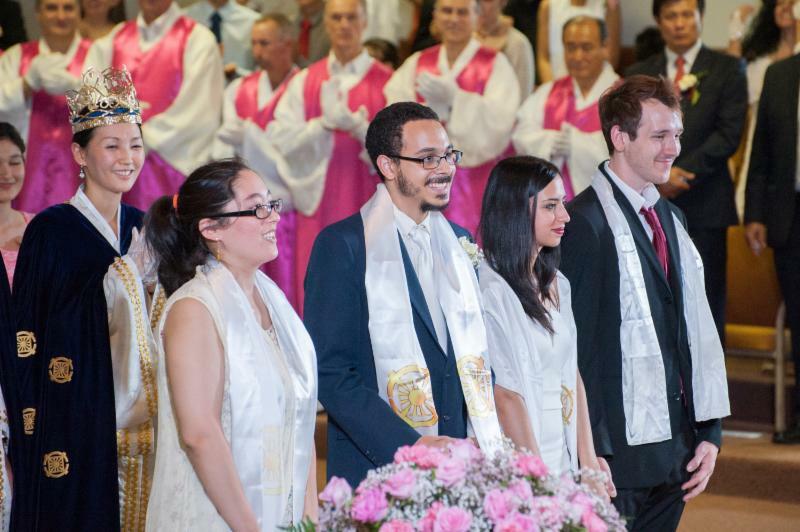 Two hundred and twelve couples received the blessing from Rev. and Mrs. Hyung Jin Moon, who presided over the ceremony as the crowned successor of True Parents. 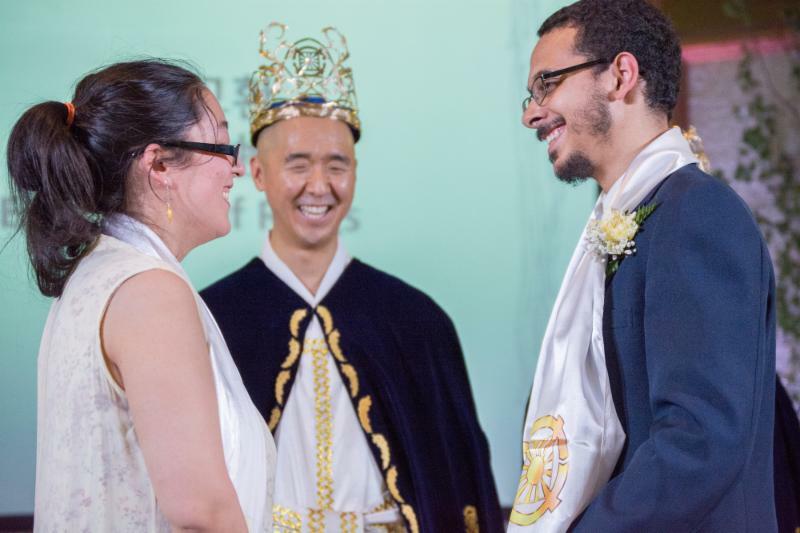 In addition, 310 couples participated from around the USA, Korea, Japan, United Kingdom, Spain, Germany, Ukraine, Italy, Switzerland, Sweden, Russia, Kenya, South Africa, Australia, Brazil, Panama, Ecuador, Peru, India, and other countries. Pastor Moon described his "wilderness" course after being rejected by the Family Federation when he moved to Lords Valley, Pennsylvania, stating that he and his family were able to live by the "grace of True Father" and living close to nature, quite a change for his children who had been living in the palace! Hyung Jin Nim explained the reason for his speaking so strongly since January of this year and how Father had told him that at the age of 33 he would have go the way of the cross. In a moving ceremony, his elder brother Kook Jin Nim recognized and crowned his younger brother as the King of Cheon Il Guk. This could take place on the foundation of Father's declaration at the 4th Dimension Registration Ceremony in June, 2012 that Hyung Jin Nim and Kook Jin Nim were the victorious True Abel and True Cain in the True Family who united centering on God's will. Hyung Jin Nim explained the meaning of the Holy Wine and Blessing ceremonies, in which the bride is married both to Christ as the true Adam and to her own husband. Rev. Bob Exler, Texas Sanctuary coordinator commented that "we made the decision at the last minute to attend. On the way of the Sanctuary Church we had to stop when a deer crossed the road and starred us all in the eyes with such a pure and innocent look. It was as if we were entering the New Garden of Eden to meet the anointed and appointed Bride and Bride room. 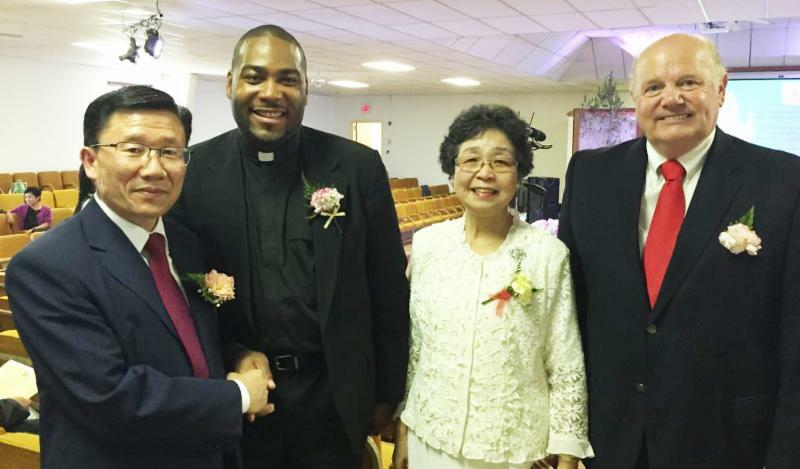 ACLC Pastor Donald Mims was so moved and grateful to attend the Holy Blessing Ceremony and meet with Hyung Jin Nim and Kook Jin Nim. He felt the presence of the Holy Spirit as never before. He embraced the Holy blessing given to him and his wife Juanita with open arms. They are now a True Blessed Clergy couple representing Christianity and Texas." After the blessing ceremony, Hyung Jin Nim as the second King of Cheon Il Guk made an historic proclamation of the "Bill of Human Rights of Cheon Il Gook."